Note: Prices for 2015 and January-June 2016 are preliminary data. Growth rate for 2016 year-to-date compares January-June 2016 with January-June 2015. Republished Friday, October 7, 2:30 p.m. to correct an error in the text. Low prices in New England so far this year should be partly attributed to last winter's mild weather. During the first six months of 2016, residential customers paid on average 12.4 cents per kilowatthour (kWh), or 0.7% lower than the same period last year. If this trend continues for the rest of 2016, annual average residential electricity prices would decline for the first time since 2002. Over the past five years, nominal residential prices have increased an average of 1.9% annually, about the same rate as overall inflation. Note: Pacific (contiguous) includes California, Oregon, and Washington. Pacific (noncontiguous) includes Hawaii and Alaska. Residential customers in most areas of the country are seeing lower retail electricity prices this year compared with the same time last year. 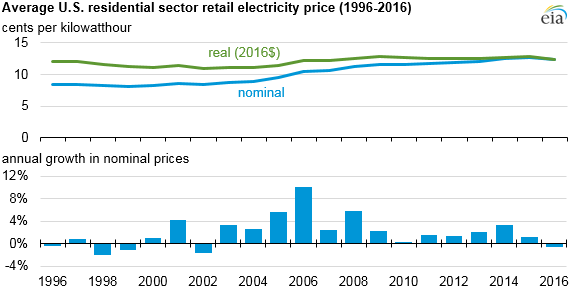 Declining costs of fuel, especially natural gas, have been a key driver of recent reductions in retail electricity prices. Over the first six months of 2016, the weighted average cost of natural gas delivered to electricity generators was $2.58 per million Btu, 28% lower than in the first half of 2015. Residential electricity prices in the New England region have fallen by 6% during the first half of 2016 and now average 19.2 cents/kWh. New England electricity prices rose substantially between 2013 and 2014 as a result of a sharp rise in wholesale power prices. Mild weather last winter, which allowed power generators to tap into the region's available supply of low-priced natural gas, contributed to declining electricity rates in New England this year. Natural gas prices have been increasing in recent months, and EIA’s latest Short-Term Energy Outlook projects the average delivered cost of natural gas in the last six months of 2016 will be 27% higher than the average cost in the first six months of the year. Because natural gas prices are expected to continue increasing in 2017, EIA also expects average U.S. residential electricity prices to increase 3% in 2017. Not all recent declines in electricity prices can be attributed to developments in natural gas markets. Hawaii consistently has the highest electricity prices in the United States, averaging 24 cents/kWh so far in 2016. Many of the utility-scale generating units in Hawaii are fueled by petroleum, and the falling cost of crude oil has contributed to a 12% decline in retail electricity prices so far in 2016. Hawaii’s electricity system has been shifting toward increased adoption of rooftop solar, with the ultimate goal of providing 100% of its electricity from renewable sources by 2045. Despite the decline in national average residential electricity prices in the first half of 2016, prices are rising in some states and regions. On average, residents of the contiguous Pacific Coast states (California, Oregon, and Washington) so far in 2016 are paying 3% higher prices than in the first six months of 2015. The regulated electric utilities in these states sought permission to increase rates to cover costs of maintaining and upgrading the region’s power transmission grid and its network of natural gas pipelines. Midwest residential customers have also experienced increasing electricity prices, with year-to-date rates increasing by 2% and 3% in the East North Central and West North Central regions, respectively.